It makes no economic sense to run more than one set of wires from electric power generators to homes and businesses. That’s why consumers haven’t had a choice about the source of their electric power – whether it be an investor-owned utility (IOU), municipal utility or electric cooperative. Enabling consumers to choose between competing energy providers is a paradigm shift, and with the advent of community choice aggregation (CCA), that shift is in gear. CCAs allow counties, cities and unincorporated areas to “aggregate” demand and procure their own electricity generation. The incumbent utilities retain responsibility for transmission, distribution and billing. Most CCAs operate on an “opt-out” basis, meaning customers in the CCA service areas are enrolled in the CCA by default, but can choose to opt-out at any time. Typically, 80 to 85 percent of customers in opt-out programs choose to go with the CCA. Today, 5 percent of the U.S. population and 1,300 municipalities, including the cities of Chicago and Cincinnati, receive their electric power through CCAs, which operate in seven states (Massachusetts, New York, Ohio, California, New Jersey, Rhode Island and Illinois) comprising 30 percent of the U.S. electricity market. The earliest CCAs first appeared in Massachusetts and Ohio in the late 1990s. But the differences between those early iterations and today’s CCAs are fundamental. “As we moved west, we got more and more sophisticated,” says Paul Fenn, author of the original CCA legislation in 1995, and CEO of Local Power, a CCA consulting group. The key development was the shift in emphasis from low rates to the generation of new, local renewable energy projects. In the early days, with prices of renewables high, CCAs focused on reducing electric rates and purchased low-cost power through the wholesale markets. As renewables became more affordable, the next generation of CCAs added “green” to their mandates and grew their portfolios by purchasing renewable energy certificates (RECs). Marin Clean Energy (MCE), California’s first CCA, was launched in 2010. Sonoma Clean Power (SCP), the second California CCA, went online in 2014. While they still compete with PG&E for the lowest rates, and include some RECs in their portfolios, both CCAs are now focused on localization – generating local renewable energy projects and creating local green jobs. Today’s CCAs can offer consumers both competitive rates and a high percentage of renewables. For example, MCE’s default “Light Green” option charges customers $80.98 for service using 50 percent renewables, whereas PG&E charges $82.42 for equivalent service using only 22 percent renewables. * MCE customers can also choose a “Deep Green” option (100 percent renewables at slightly higher rates) or “Local Sol” (100 percent local solar at the highest rates). Both MCE and SCP also encourage local build-out of residential and commercial rooftop solar by crediting customers an extra cent per kilowatt-hour for excess electricity. “We launched with [NetGreen], an enhanced net-metering program to further incentivize building systems that meet 100 percent of customer load,” notes Syphers. CCAs also enjoy the flexibility to tailor their renewables portfolios to local opportunities. 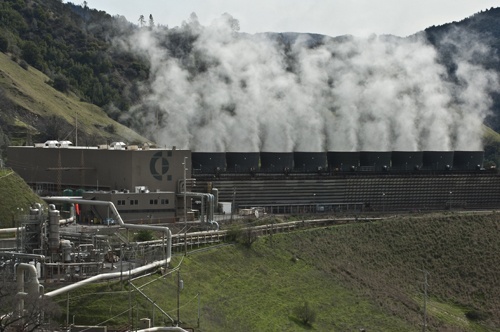 SCP has contracted for 50 megawatts of power from Calpine’s existing, Sonoma-based Geysers facility, the largest geothermal electrical project in the world. SCP draws another 70 MW from a new California solar farm, and has contracted for an additional 12.5 MW from an innovative floating solar photovoltaics facility that will cover six water treatment holding ponds in Sonoma County. Sonoma’s “flotovoltaics” project will go online in 2016 and will be the biggest project of its kind in the U.S.
Ditching a provider of reliable electricity – even if the power is expensive or dirty – can seem like risky business to many cities and counties. But the success of CCAs in California, and the natural appeal of freedom of choice, is lowering resistance. Many additional California counties and regions – including San Luis Obispo, Alameda, San Mateo, Monterey Bay Area and Santa Monica Bay Area – are moving toward adopting a CCA model. The city of San Diego’s Climate Action Plan calls for the implementation of a CCA, a not-insignificant development given that San Diego represents 40 percent of San Diego Gas and Electric’s customer base. After a decade of bureaucratic haggling, San Francisco’s CCA, CleanPowerSF, is finally expected to go online later this year. Sustainable Westchester, a New York CCA, was approved in February 2015 by the New York Public Service Commission, and is an integral part of Gov. Andrew M. Cuomo’s Reforming the Energy Vision (REV) plan to revamp that state’s energy strategy. The next frontier in the evolution of CCAs may be solar bonds or "H bonds." These municipal bonds would provide funds for residents and businesses to finance renewable energy projects, the debt for which would be paid as a line-item on electric bills, i.e. through “on-bill financing.” Solar bonds would face many of the same challenges and opportunities as property assessed clean energy (PACE) financing. Authority to issue H bonds was approved by voters in San Francisco in 2001, although no bonds have yet been issued. With financing a primary obstacle to the development of rooftop and other solar projects, the availability of solar bond financing could help unleash a flood of new renewables development. In today’s complex world, we may already have too many choices. Proponents of CCAs are hoping consumers of electricity are prepared to take on one more. *Based on typical usage of 463 kilowatt-hours at PG&E’s rates as of March 1 and MCE’s current rates for the April 2015 to March 2016 fiscal year under the Res-1/E-1 rate schedule. Max Bloom is a freelance journalist and marketer of renewable energy products and services.